Jim and Catherine Greenstreet with twins Thomas and Freddie (top). Big brother William and sister Lizzie (bottom). These newborn twins are the picture of health. The two designer babies were born after their mother underwent a controversial screening process to ensure they were disease-free. Freddie and Thomas Greenstreet's parents both carry genes that made it highly likely their children would be born with cystic fibrosis, a debilitating, inherited condition from which their daughter suffers. So their mother Catherine decided to have her embryos screened and to be implanted only with those that were healthy. Today, Mrs Greenstreet, 38, defended her decision to reject the imperfect embryos, saying she and husband Jim, 41, did not want to repeat the experience of caring for a seriously ill child. "Unless you have lived with a child that has a terrible disability or disease then you can't speak about it," she said. "Who can criticise you for trying to get rid of horrible diseases? Why would you want to see people suffer? When you have got these lovely healthy babies in your arms it dampens all the pain we went through. They are designer babies but they are designed for the good of mankind." 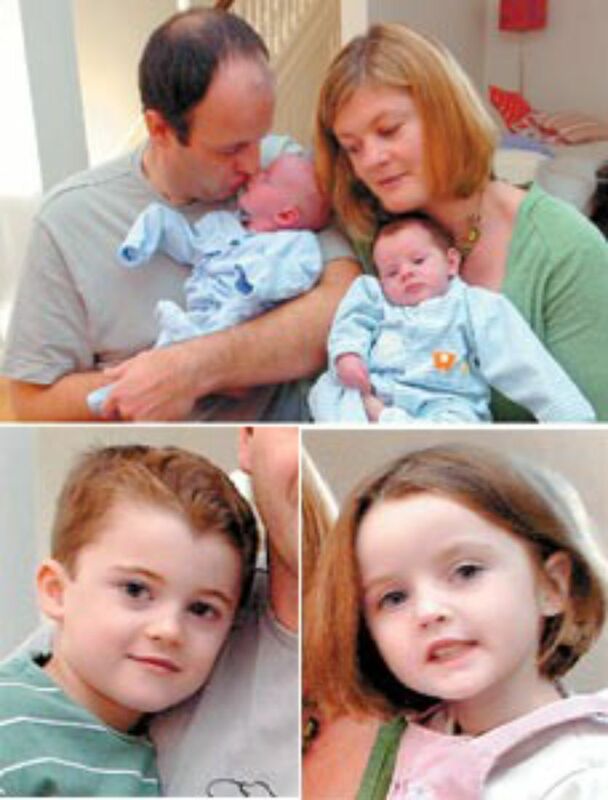 Mrs Greenstreet, a physiotherapist, and her husband, who works in corporate finance, already have five-year-old twins, William and Lizzie. Lizzie has cystic fibrosis, which causes severe respiratory problems and limits life expectancy. William has not got the disease but may be carrying the faulty genes. Opponents of genetic screening argue that disabled babies can have a good quality of life and screening for any reason is the start of a slippery slope towards parents choosing eye colour or characteristics. But having witnessed Lizzie's struggles, the Greenstreets, from Chiswick, decided to have the treatment at Guy's Hospital. First, Mrs Greenstreet had embryos created through invitro fertilisation. Then a single cell was taken from each embryo and tested for the faulty genes. Only healthy embryos were chosen and implanted into her womb. The technique has been used before but the method - called pre-implantation genetic haplotyping (PGH) - has been enhanced by doctors at Guy's so embryos can be tested for up to 6,000 conditions. Freddie and Thomas, who were born on 30 October, are the first babies in the UK to be delivered after use of this particular method and the 100th birth since the screening programmeat Guy's was set up. Mrs Greenstreet said the whole experience was an emotional rollercoaster. "The odds of getting pregnant were lower having had the PGH than with standard IVF but I didn't want to have normal IVF and then find I was carrying a child with cystic fibrosis," she said. "It was so reassuring to know that we would not have to deal with it." Alison Lashwood, a consultant nurse in genetics, said: "It is fantastic to have helped so many couples who were carrying genes for serious genetic disorders to have the babies they thought they could never have. "We are very proud of this achievement and, as one of the biggest and most advanced centres in Europe, we hope we can help many more couples in the future."